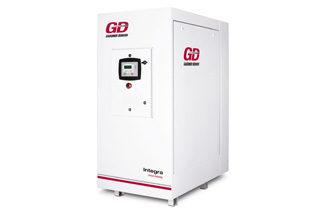 The Integra is offered from 15 – 50 hp and comes in a small, compact footprint. State-of-the art, integrated design with 25% fewer parts and connection points than conventional design delivers maximum reliability. Modular airend design offers a readily accessible bolt-on configuration unlike encapsulated designs that require total replacement. Internal 3-way thermal mixing valve minimizes leak points. Three-stage air/oil separation involving mechanical redirection, cyclone centrifugal type air flow and a pleated filter with inside out final separation to offer less than 2 ppm carryover before the aftercooler. Non-corrosive control line tubing maximizes reliability, minimizes downtime. Tactfully located controller on the end of each machine for easy multiple unit installation and sequencing. Manufactured in one of the most automated, capital intensive rotor cutting plants worldwide. Rotor profile with a short seal line saves you money in electrical costs by offering high efficiency through reduced opportunities for air leaks. 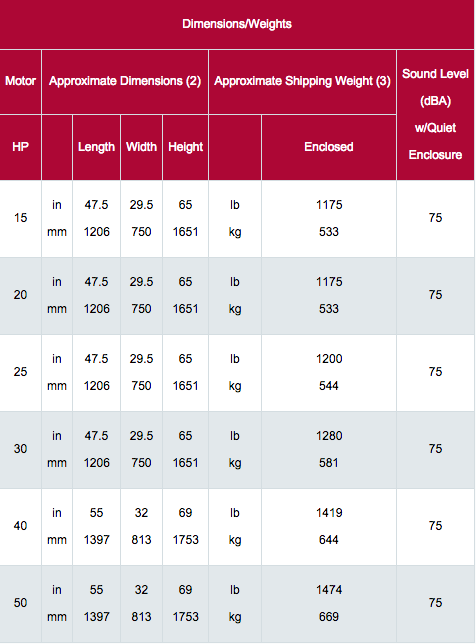 Precise bearing size that prohibits misalignment. This handles up to 3 times more load capacity than conventional designs to offer you a savings in service costs and extends operation life. Standard enclosure offers low 75 dBA noise level to ensure quiet operation at any facility. Easy lift-off panels offer fast and convenient access to airend and motor.